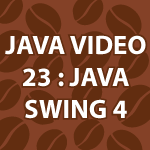 Today I complete the Java Swing tutorial I started in part 22 of the Java tutorial. I implement the Swing event listeners. I then cover how to format numbers in Java so that they have commas or are displayed as currency. JOptionPane, a useful popup window in Java is introduced. And, finally I review much of what we have done in past Java Swing Tutorials. All of the code follows the video. You should look at it to help you learn. I use internet in a daily basis for over 12 years, and I must admit that today, I had a weird feeling! The information you provide throught your articles and videos is enormously valuable and mind-blowing, so that I want to send you 1000 dollars, just to thank you. Of course I am not rich, but I must say that this feeling is so new to me. Keep up the good work, I need more time to go deep in the knowledge which so kindly (and free) you provide to us. Keep up the good work! Thank you 🙂 It makes me very happy that you enjoy the site. Don’t ever feel obligated to donate anything. I don’t do this for money. If I did I’d cover all of my videos with pre-roll ads on YouTube. Sites like mine aren’t supposed to work. You’re not supposed to cover numerous topics. I’m so happy that I have the freedom to cover programming, psychology, cooking, or whatever random thing I’m interested in. I’ll soon start covering electronics, chemistry and microbiology. It’s a fun hobby. I’m glad other people find use in it. I’m also very happy that people all over the world seem to like it. I’m actually more popular in numerous other countries well beyond my popularity in the US. Your java tutorial videos are excellent, best I’ve seen on the net. Do you know where I can find similar tutorial for C#. what is the mean of this, and why you used it here?? Great Videos; Rich in content. The best ever video tutorials till date I found on this amazingly connected world. Thanks for the videos. Videos helped me a lot. Again, I am thankful to you from the bottom of my heart ..! If possible, could you tell which desktop screen recorder you use to record the videos? Hey again Derek (my username on here was SilentSonance), at this point in your series I decided to try and make something of my own, so I tried to create a currency converter. Everything works pretty well with it except it always executes the catch-block in the KeyListener class. I want it to update the converted amount dynamically, that’s why I have it set up the way I do. It runs just fine after the first key is pressed and the JOptionPane window is gone. If you get a chance, could you look over the source code real quick? Thank you again (I’m SilentSonance on YouTube) so much for all these tutorials, I feel like I’m learning a ton. I’ll take a look as soon as possible. I’ve been overwhelmed with work lately. I cover a ton more on Swing as the tutorial continues. You may also like to take a look at my MVC Java Tutorial. in the action listener if statement right after the catch, netbeans says that it’s expecting two doubles not two doubles and the ‘howMany’ int. int the addNumbers, subtractNumbers etc methods I’m getting errors but I think it’s the same problem… Netbeans wants another parenthesis where it shouldn’t. It also no longer likes the return statement saying its not necessary. I have double checked the code but cannot see an error. If this isn’t enough info I’ll paste it in. If you have the time I’d be grateful for the help. lol… I checked it again!! not even going to admit to the error that I found.. Sorry for bothering you!! I hit a snag with the Regular Expressions, but picked it back up with Swing. Can’t wait to work on some text based games later on! thanks for your very excellent work derek. Thank you 🙂 getCurrencyInstance() actually returns a NumberFormat object. That is why you don’t need new. I get into this later in the tutorial. I can never thank you enough. It is something I have to deal with everyday but programming is not taught very well in a lot of universities, mine in that category. But the video and audio combination is just perfect. The speed, the tone, the content are all perfect Derek. It’s just what I and millions of other people need and you are the man to give it to us! Thank you very much for taking the time to tell me that I help 🙂 I very much appreciate that. I will continue making tutorials for as long as possible and they will always be free. Hey, first off I want to say that you are doing a great job. There is something that I feel will help out everyone though. I feel that you should teach proper formatting and organization of code. Getting people used to grouping certain objects is going to help them so much in the long run. I am following you tutorials but just using my own organization. In the long run it will help people write better code and it is easier to edit the program if need be. Once again great work on these tuts, sorry if this comment doesn’t really matter because the video is over a year old. Just thought I would put my time in to give you some feedback for all the time you put in for us 😀 Thanks! Thank you 🙂 I’m very happy that my videos are helping! I finally managed to fix it and do what you did, but i get a .jar file not a .exe file, so windows users will have to right click select open with java SE binary – a real pain. I fixed it thanks for your amazing videos they are incredibly helpful.